Plants are not the only invasive species. Insects can invade and bring devastating results especially when there are no predators for them in their new territory. According to the May 11, 2016 Boston Globe, “The invasive forest pest are ravaging woods and urban canopy across the country, costing property owners and communities, especially in the Northeast, billions a year, according to a study released May 9 by the journal Ecological Applications.” (Esajournals.onlinelibrary.wiley.com). These invasive pests are taking a harsh toll on trees in Massachusetts, which is home to 57 types of invasive pests. This is more than any other state except New York and Pennsylvania. The list of invasive insects in Massachusetts include the winter moths who have devastated forests in the eastern part of our state; oak crypt gall wasps which kill black oaks especially along our southern border and islands; the hemlock wooly adelgid; the emerald ash borer which was seen in the Berkshires in Dalton in 2012; and the Asian long-horned beetle which seems to be eating its way through red maples in the central part of our state at the cost of more than $150 million dollars for the removal of 34,000 trees. The list continues with other pathogens including butternut canker, dogwood anthracnose, Dutch elm disease, and beech bark disease. Frank Lowenstein, deputy director of New England Forest Foundation, a conservation group in Littleton wants the United States to do more to protect our forests. “Trees are vital to our air quality, water quality, and the stability of our climate. They’re the foundation of life in New England.” He states. The Ecological Applications study estimates that 63 percent of US forest land (825 million acres) is at risk of increased damage from existing pests. An example of this type of devastation has been the virtual elimination of the American chestnut. Solutions? One suggestion is the need to eliminate the use of wood packing materials (pallets, spools) which harbor and bring in more pests to our country and throughout our country every year. Alternatives would include plywood, strand lumber and other non-solid-wood packaging. A ban on all live plant material into the country has also be suggested. A simple example of disease importation on live plant material from an overseas country was the August blight that destroyed our Impatiens (Impatiens balsamina) a few years ago. The Asian long horned beetle is one of the pests that was brought into our country through wood packing material. “We need to act now to strengthen prevention if we are going to protect billion of valuable trees,” added Gary Lovett, a forest ecologist at the Carey Institute of Ecosystems Studies and one of the lead authors of the study from the Ecological Applications journal. Here is a review of some of the new invasive insects to our forests, but first a new-comer, right in our own back yard. We don’t yet know the extent of damage of this new invader may have on our native bees. 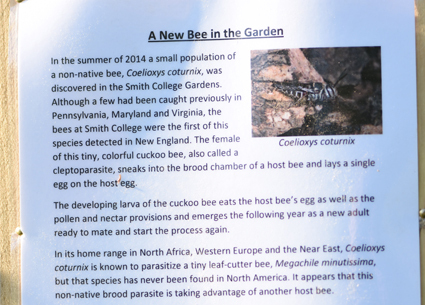 In 2014 at Smith College, a new bee was seen. These bees, Coelioxys coturnix, were previously only detected in Pennsylvania, Maryland, and Virginia. This is the cuckoo bee, which sneaks into the brood chamber of a host bee and lays a single egg on the host egg. (The majority of native bees do not nest as a group in a hive, but lay single eggs within ground holes or in bored holes in tree trunks). The cuckoo bee larva eats its host bee’s egg and any pollen that the host bee had placed for its own larvae. The cuckoo bee emerges in the spring to mate and start its egg laying cycle again. The Coelioxys coturnix home range is in Africa, Western Europe, and the Near East and it parasitizes a tiny leaf-cutter bee, Megachile minutissima, for its egg laying in these regions. The mystery is that the Megachile minutissima has never been identified in North America. So who is playing host to the Coelioxys coturnix? 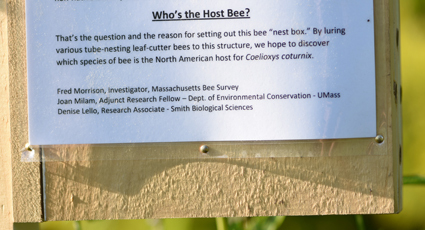 At Smith College a bee “nest box” has been set up to lure various tube-nesting leaf-cutter bees to this structure, to discover which species is the unsuspecting host. Hemlock woolly adelgid, or HWA, is member of the Sternorrhyncha suborder of the Order Hemiptera and native to East Asia. It is a small aphid-like insect that feeds by sucking sap from eastern hemlock (Tsuga canadensis) and Carolina hemlock (Tsuga caroliniana) and spruce trees in the Eastern United States. The hemlock woolly adelgid develops and reproduces on all species of hemlock, but only eastern and Carolina hemlock are vulnerable when attacked. Other hemlock stressors, including drought, poor site conditions, and insect and disease pests such as elongate hemlock scale (Fiorinia externa), hemlock looper (Lambdina fiscellaria fiscellaria), spruce spider mite (Oligonychus ununguis), hemlock borer (Melanophila fulvogutta), root rot disease (Armillaria mellea), and needlerust (Melampsora parlowii), accelerate the rate and extent of hemlock mortality. Invasion by HWA is usually the final blow. Emerald Ash Borer (Agrilius planipennis) was first discovered in southern Michigan in the 2002. The EAB was found in Massachusetts in Dalton in 2012. The EAB may have been introduced to North America in wood packaging at ports in eleven eastern states. It has now been documented also attacking White Fringetree (C. virinicus). The emerald ash borer is native to Asia (China, Korea, Japan, Mongolia, the far east of Russia, and even Taiwan). The pest also feeds on Ulmus (elm) and Juglandaceae species (walnuts and hickories) in its native range. Larvae feed in the phloem and outer sapwood, producing galleries that damage and eventually kill the host. Adults feed on host foliage. Eradication is no longer the plan for elimination of the emerald ash borer. Programs are now focused on curtailing human movement of the insect to new areas through ash nursery stock, green lumber (prior to kiln drying), other material such as logs, stumps, roots, branches, composted and uncomposted chips, and the movement of firewood to non-infected areas. Firewood has been implicated in dozens of infestations found in or near campgrounds, and then onto unsuspecting homeowners’ property. The Asian Longhorned Beetle, also known as the starry sky, sky beetle, or ALB, is native to eastern China, Japan, and Korea. Adult beetles are large, distinctive-looking insects measuring 1 to 1.5 inches in length with long antennae. Their bodies are black with small white spots, and their antennae are banded in black and white. It has been spotted in central Massachusetts, and even in the Boston Area at the Faulkner Hospital, across the street from the Arnold Arboretum. The ALB was probably introduced to the United States through wood packing material (wood pallets and crates) at ports. The wood packaging material was taken home by unsuspecting homeowners for use in various projects at their properties. As with the Emerald Ash Borer, the female ALB lay an egg under the bark of a tree. When the ALB egg hatches (approx. 2 weeks) the larva bores in the tree, feeding on the living tissue that carries the nutrients for the tree just under the bark. As the larvae develop and feed, they are forming tunnels in the tree trunks and branches. Evidence of infestation in the form of sawdust-like material (frass) can be seen at the trunk can branch bases of infested trees. Report any sighting of either EAB or ALB to the US Department of Agriculture, Animal & Plant Health Inspection Service.